Juniper Village at Monte Vista is home to approximately 60 residents and is dedicated to nurturing the spirit of life in each individual we serve. We believe that the keys to healthy aging are an active body, an engaged mind and a fulfilled spirit. No matter what the individual limitations might be, through our Alive in All Seasons Program, we encourage and respect each resident’s individuality and ability to remain physically fit, socially connected to friends and family and have their spiritual needs fulfilled. 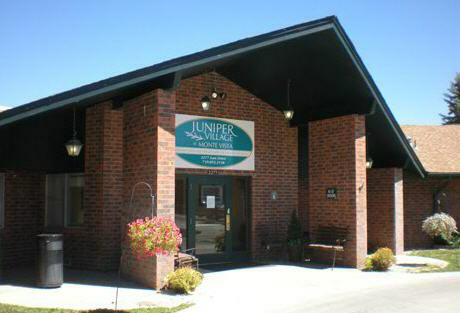 The staff at Juniper Village deliver care with a holistic health care approach. Located in the San Luis Valley between San Juan and the Sangre DeChristo Mountains of southern Colorado, close to Sante Fe and Taos, New Mexico, Juniper Village at Monte Vista enjoys a beautiful environment both inside and outside the residence. Newly renovated in 2007, Juniper Village at Monte Vista offers bright and open common areas and an all new dining room with family style dining. All resident rooms are on the first floor for safety and convenience. Renowned for its friendly, personal atmosphere, the residence offers a fireplace, outdoor pond, birds and a greenhouse where we grow our own flowers. Residents are encouraged to decorate their own rooms to reflect their own personal style. Cozy semi-private and private rooms feature private baths.